This quick tutorial is so you know the steps to get the M16 into the water. The boat is stowed in dry slip F10 where it has a boat cover. Just untie the ropes on the brown cover on the starboard side and throw the ropes under the boat to the port side. There are six small ties holding the gray cockpit cover to tie downs on the deck. Untie these too. 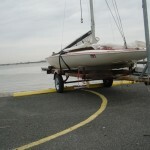 Undo the zippers and ties around the mast and then roll the boat cover from front to back and leave the cover on the ground near the concrete bumper. Make sure to close the self bailers at this time. The boat is stored with bailers open so it can drain out. If you put the boat in the water with the bailers open it will take an hour to sink, so don’t panic if this happens. 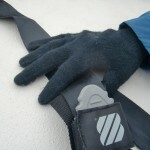 After you close bailers, loosen the buckle on the seatbelt that holds the boat to the trailer. Leave this whole assembly at the slip under the cover. Tip: don’t undo buckle on the belt …just loosen the buckle and unclip the belt from the trailer. This buckle is an insane piece of engineering that would take Albert Schweitzer half a day to re-assemble. Hook up the lifting bridle, checking each shackle to make they are tight and the lines are not twisted. Roll the boat to a lift that works. It is easiest if you align the boom with the chain and hook overhead. If you roll the boat so the boom is directly under the hook, it makes the lift easier. The rear of the boat will hang over the water. Lower the hook to the lifting bridge and hook it. Before you raise the boat, be sure to untie the painter at the bow and someone holds this. The lift has a thick rope that checks the swing over the water. Uncleat this and toss it over the boat to the side of the lift where the buttons are located. Make sure someone is holding on this so the big I-beam on the lift does not get blown out over the water before you are ready! At this point, it’s best to have two people. There are usually lots of people around the dock, so recruit a volunteer to run the buttons if you are single-handing. 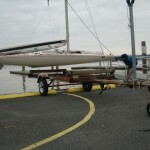 Try to raise the boat gently so you can spot any tangles before it is high off the trailer. The person holding the ropes will walk the bow of the boat away from the base of the lift so the mast clears the lift overhead. The bow will point away from the lift. When the boat is over the water, your button pusher presses down and the boat is lowered in the water. Make sure there is slack in the bridle before getting into the boat. You don’t want the boat to be in the air when you get in! Someone needs to jump into the boat and unhook the bridle. They walk the boat to the dock to cleat it. Your button pusher should cleat off the white line that controls the lift.